Theoretically, the county commissioners are supposed to represent all of Monroe County. Though they are assigned to a specific geographic district, they are elected by voters county-wide. While they certainly need to represent their own districts effectively, they should also be looking out for the interests of all the citizens of Monroe County. It is well-documented fact that they have failed to do that when it comes to the wastewater projects. The projects have been grossly mismanaged by the Board of County Commissioners (BOCC) and county staff. The financial impact of that mismanagement is absorbed by taxpayers county-wide, but especially by those in Key Largo. The Cudjoe Regional project alone is $43 million over the original bid. The BOCC reduced the assessment on that service area by $10 million, which increased the financial need to $53 million. The money to fill that gap will come primarily from the infrastructure sales tax which is collected county-wide – from Ocean Reef to Key West. There are needs throughout the county. How will these needs be met if tax money is squandered so recklessly on one project? Unfortunately, this is an ongoing pattern. Big changes are needed in Monroe County government. There is no doubt about it. The Keys simply cannot continue like this. Fortunately, there’s a tourism boom going on right now so not everyone will feel the pain immediately. Data indicates that Key Largo is stagnating compared to other areas of the Keys. No surprise. You cannot impose an unfair $26 million financial burden on such a small community without consequence. Key Largo is also a lower-income community compared to far wealthier areas that have been so very generously subsidized by the BOCC. I discussed the financial effects here and here. What happens when the economy takes an inevitable downturn? Despite the county’s claims to the contrary, Key Largo is a major contributor of tax revenue – the second largest contributor of the sales tax next to Key West. How does a faltering Key Largo affect the overall financial health of the Keys? I personally, do not want to find out – but I’m very afraid I will. I would love to focus on the funding disparity but there is very little from the commissioners on the record regarding that. The BOCC avoids substantive public discussion of the topic like the plague. They prefer to be vague and mysterious. Easier to dodge responsibility that way. If I can find something I’ll definitely include it. There have been a few misleading public statements made by the county administrator, which I discussed here and here. Looking at pivotal votes and actions regarding the Cudjoe Regional project might shed some light on the wastewater issue as a whole. Which BOCC members are doing their jobs or at least trying to? Which ones are not? Who pauses to consider the county-wide impact of their decisions? Who thoughtlessly throws good tax money after bad without a care in the world? There’s an election coming up next year. This is when voters can make themselves heard. So who’s up for election? District 1 – Danny Kolhage. District 1 includes Stock Island, Key Haven and part of Key West. District 3 – Heather Carruthers. District 3 covers the remainder of Key West. District 5 – Sylvia Murphy. District 5 covers the island of Key Largo, which includes Ocean Reef, Key Largo and unincorporated Tavernier. District 5 also covers the northern tip of Plantation Key, which is part of the Village of Islamorada. The District 2 and District 4 seats were up for election in 2014. The Cudjoe Regional project is located squarely within District 2, represented by Commissioner George Neugent. 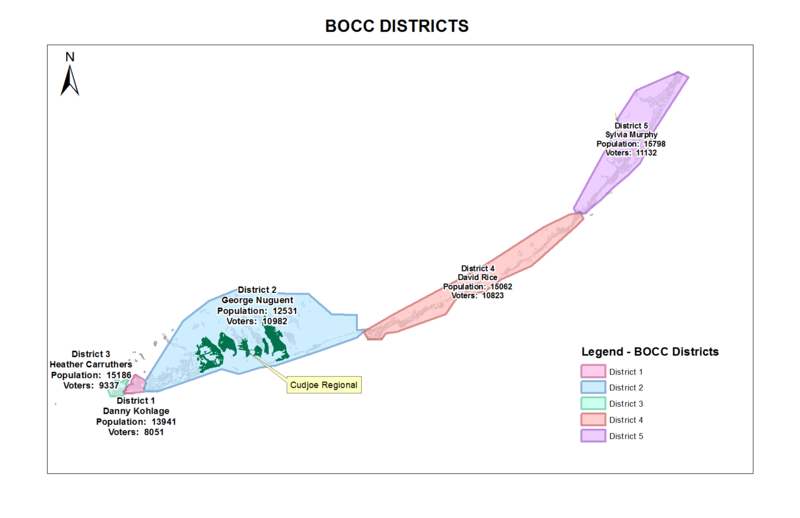 District 2 includes Boca Chica on one end and a small part of Marathon on the other. District 2 incumbent Comm. Neugent defeated Danny Coll and Eleanor McAdams in the 2014 election. District 4 includes nearly all of Marathon and all but the northern tip of Islamorada. Comm. David Rice ran unopposed in the 2014 election. I’ve provided a district map below. It also includes the Cudjoe Regional area. In this series, I’ll focus on each commissioner in turn starting with the ones who are up for election in 2016. This entry was posted in BOCC, Bubba System, Key Largo's contribution, Monroe County, Wastewater. Bookmark the permalink.